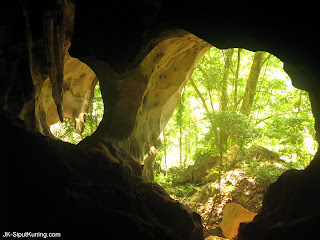 "Kinta is a curious valley, walled with abrupt limestone cliffs and pinnacles, and ranges of weird hills full of caves, which gave the landscape the same wild character as those of Moulmein." -C.M. Enriquez, Malaya: An Account of its People, Flora and Fauna, 1927. 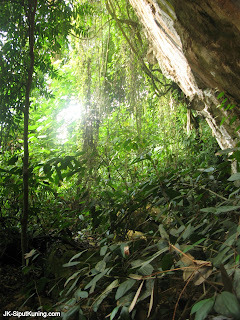 The lush rainforests of Gunung Kandu. Towering white cliffs draped in lush vegetation overlooking the vast valley below, Gunung Kandu (Kandu Mountain) has remained as it is millions of years ago. 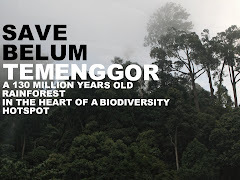 It has seen Paleolithic men chasing wild beasts across the bushlands, early Sumatran settlers clearing forests for fruit orchards and colonial era western adventurers wandering into its forests. Now, in its old age, it is inviting a new breed of visitors- tourists. And here I am with them, beating through the belukar (regenerating bushlands) on its foothills. 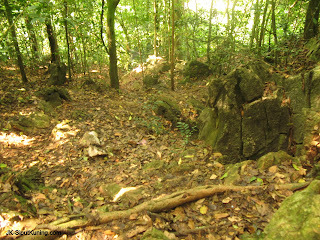 The forests near the entrance of Gua Kandu. Minutes later, we emerged from the thick foliage and into a treeless chasm. A large, dark and forbidding gap in the hill signals the entrance to the ancient geological formation of Gua Kandu (Kandu Cave). 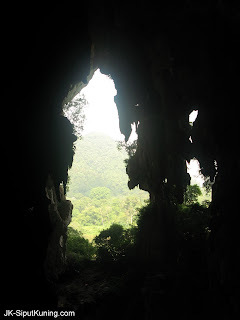 Spanning 1100m in length with multiple entrance and passageways, it is the 7th longest cave in the Malay Peninsular. 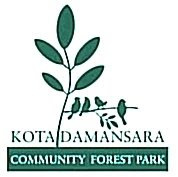 Having been shortlisted as one of the ten most important karst conservation sites in Kinta by the Malaysian Nature Society, its hill owns the typical karst title as one of the significantly high endemic wildlife diversity locations in Perak state, Malaysia. Thus, it takes no time to spot one. I found these ferns, most probably endemics, growing on calcified red guano. 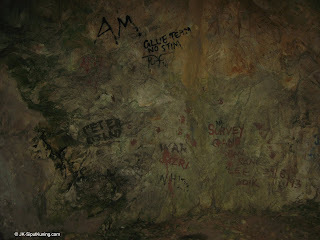 However pristine the cave may be, Gua Kandu has its fair share of vandalism by irresponsible visitor. Our guide, David of Gopeng Rainforest Resort, made a quick briefing to our motley gruop of thrill-seeking tourists and wildlife enthusiasts. Soon, we were heading into the darkness through a low passage. 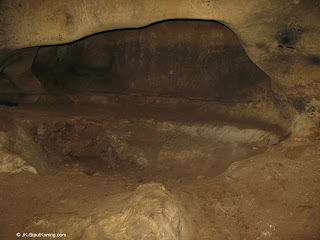 It seems that Gua Kandu used to be a water cave with a stream running throughit, much like that of Gua Anak Tempurung. 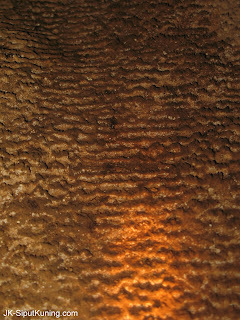 The water stains along the wall of the cave possibly shows water levels of an ancient subterranean stream. 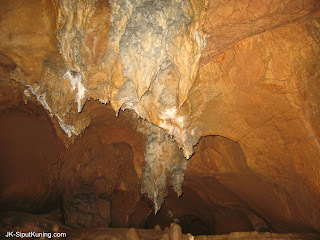 Dried crystals along the cave ceiling may well be growing wet crystals thousands of years ago. 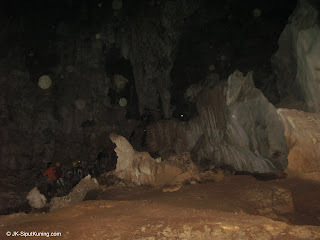 As in many caves in Kinta Valley, Gua Kandu is a communist guerrilla hideout during the Malayan Emergency days. The insurgents made use of the impenetrable darkness of the cave as barrier for their enemies. Therefore, it is no surprise that we found remains of their presence in the form of graffiti (as seen below). Remnants of a dark past on the walls of one of the cave's chambers. 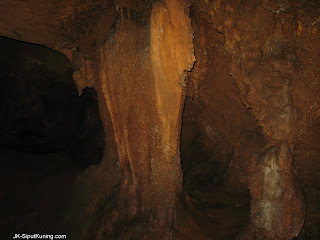 Walking deeper into the cave, we came across an area with active, wet speleoterms (stalactites and stalagmites). 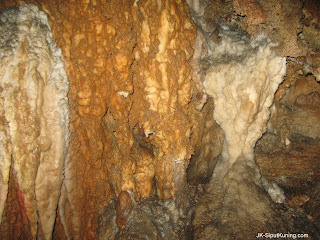 Various colours of stalactites indicate a rich composition of minerals and dissolved metal oxides. Beaitiful "pillar" speleoterms displaying rust colours due to high iron contents in the dissolved limestone. 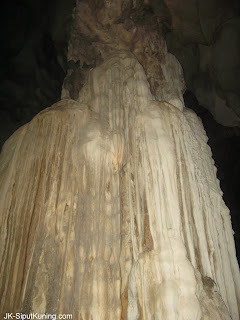 A smaller version of the "cascading" speleoterm can be seen along the cave walls. these are quite rare. 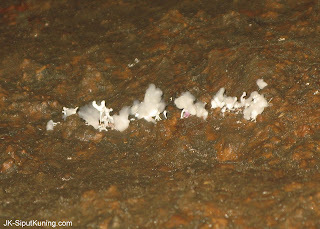 Surprisingly, there are a small number of fungus growing on bits and pieces of plant debris deep in the cave. 45 minutes into the cave, we had to clamber between a narrow sandwich of rock and guano floor before emerging into a larger chamber. The scene here is surreal with large sinkholes across the cave floor and a low ceiling over them. 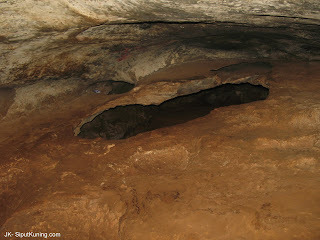 One of the sinkholes in the low cave chamber. Coming out of the tunnel, we passed a deep pool of water with steep guano deposits on its side. Roosting bats chattered high above us as our flashlights broke the darkness of the chamber. Larger flow stones can be seen on both sides. Magical "curtain" stalactites soar up into the chasm above. An otherworldly scene in the cave. Large curtain stalactite reminiscent of a frozen waterfall. Another speleoterm resembling a pipe organ bathed in natural light from a cave opening nearby. 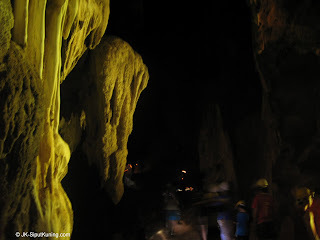 The two cave openings that allow some light into the dark recesses of Gua Kandu. Passing several circular cave openings, we walked across a guano filled platform flanked by walls reaching up to 20m to the end of the passage way. Here, a small cliff gave way to a lower cave floor. We descended down the cliff with assistance of a rope and squeezed through a natural undercut at the cul-de-sac of the lower platform. A strange composition of a rock vein resembling Statute of Liberty. The chamber behind this structure was even more impressive with its ceiling almost 30m above us and speleoterms perching up the rocky slopes on both left and right, like guardians of an ancient temple. The immense size of the chamber with its majestic formations. 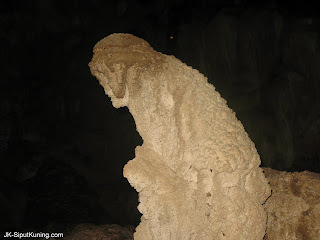 A stalagmite with the uncanny appearance of a perching monkey. Scaling to the top of the slope on the right, we spotted a peculiar shaped rock with the features of a lion head. Bright sunlight floods the area with two large openings facing the North-South Highway. From here, its a long way down a deep algae covered rock valley before climbing back up to the cave opening and out into the forests. However, we chose not to pick that path and descended back into the dark valley we had came out from instead. 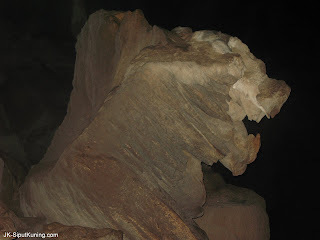 The Lion's head is arguably one of Gua Kandu's most famous icon. The cave opening facing the North-South Highway. The deep valley between the slope and the cave opening is rugged and tricky to navigate. 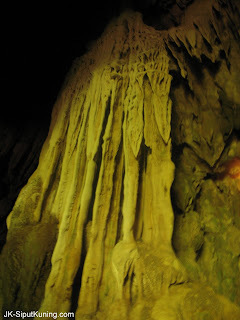 A long beam of sunlight can be seen travelling down from the upper part of the cave and illuminating a section of some beautiful "cascade" formations below. 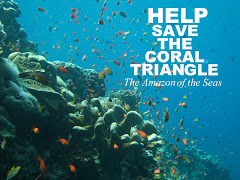 It is a truly amazing sight yet surprisingly natural. 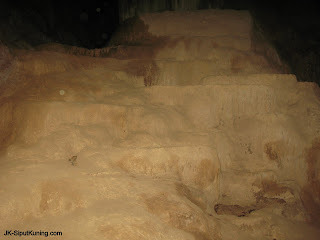 We followed the path through the lighted area and ascended to the small exit on the other side of the cave. Turning over a sharp bend, we crossed a dried section of some large "cascade" speleoterms before reaching out through an opening and into the bright forest outside. I have found some Brotia costula varicosa (Torschel 1837) freshwater snail shells with their apex removed lying around loose soil at the cave opening. This is definitely a prehistoric food leftover as there are no sign of any water bodies in the immediate vicinity and this location is some 30m above ground level from the valley below. A large "cascade" formation near the cave opening. 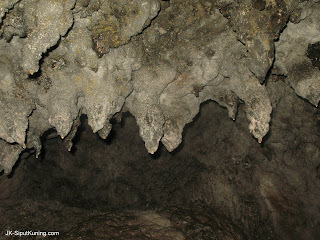 It is a highly sought after find for speleologists and cave enthusiasts. 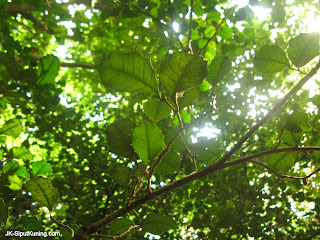 Finally, we were out under the forest canopy. Now, it's a slow descend down slippery moss covered limestone and avoiding pitfalls disguised by fallen leaves all the way to the foothills. A typical scene of a karsts' forests on the upper elevations- thick beddings of relatively wet leaves interspersed with algae and moss covered rocks, shrubs and gnarled trees. The strange thorny leaves of a probably limestone-endemic shrub. Most plants living on limestone soil contains high concentrations of calcium in their tissue which serves as a shell-building source for snails. A perfect way to end the trip- I've found an interesting snail! This is Platyrhaphe lowi (de Morgan 1885). It fuses mud with its calcium rich mucous and glue them onto its shell, blending it into the soil habitat. What a great little cyclophorid. And what an excellent day out. Thanks for your comments, snail! 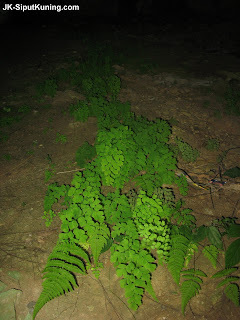 The picture of unidentified ferns has been reviewed and the morphology of the specimen photographed seems to point to the Brittle Maidenhair Fern, Adiantum tenerum, which is rather widespread and common in coastal and limestone areas.